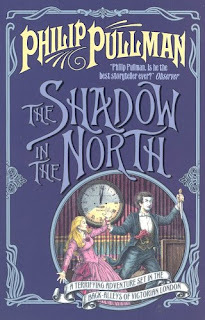 The Shadow in the North is a book written by the British author Philip Pullman, the author of the famous His Dark Materials Trilogy. It is the second book in the Sally Lockhart series and its prequel (The Ruby in the Smoke)'s review can be read here. This book has some amount of mystery, but it is more of a thriller unlike its prequel which was devoid of its thrill element. This would appeal to those who like mystery novels and those who like to read books that happen in the previous centuries. The main characters in this book are Sally Lockhart, Frederick Garland, Jim Taylor, Alistair Mackinnon and Axel Bellmann. Sally Lockhart is a twenty two year old, is a financial consultant. She studied at Cambridge but didn't have a degree because at that time, women cannot obtain degrees from British universities. Her only companion in her office is a huge black dog named Chaka. She also has a stake in Frederick Garland's business. Unlike a woman of her time, she tried to earn her own living, use a pistol but over these six years, she has lost her assertiveness and she has started to depend on Frederick Garland, although she refuses to show it. Frederick Garland is a passionate photographer, who runs a business with his uncle, Webster. He is in love with Sally but she is not willing to accept his proposal yet. Jim Taylor had lost his job after The Ruby in the Smoke due to the liquidation of Lockhart and Selby. He is currently a detective, working with Frederick Garland and also works in a theatre, helping the backstage activities. Alastair Mackinnon is a stage actor, a magician and also has some psychic powers. 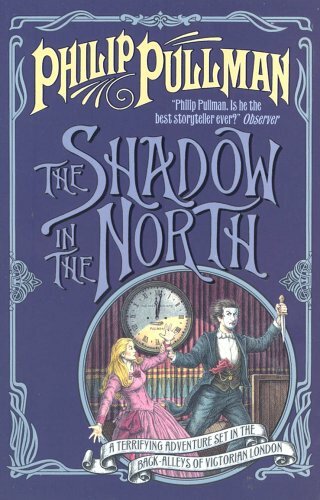 Axel Bellmann is the richest man in Europe, but he has achieved it only because of his cunning abilities. He is the main antagonist in this book. The story happens in 1878, with Mrs Walsh, an old woman, a client of Sally, going to Sally's office. Sally had told her to invest in certain shares but those shares had crashed because of the sinking of a ship heading to the Baltic, Ingrid Linde. It was suspected by Sally that Axel Bellmann had a hand in this since he was the only beneficiary from this accident. Sally felt responsible for Mrs Walsh's loss and she took it up as her own responsibility to retrieve the money. Alistair Mackinnon was going to be killed and he asked Jim to help him escape. Jim takes him to Garland and Lockhart's business place where he claims that he has psychic abilities and manages to convince Frederick and Webster Garland although Jim is not convinced. According to him, when he was in a theatre, through a matchbox, his psychic abilities made him see a man killing another man and there was snow all around. In the very next moment, he saw Axel Bellmann, the man whom Mackinnon had seen in his psychic vision. Bellmann knew that Mackinnon had found out something about him and had started chasing him. Sally Lockhart is investigating all sorts of things about Bellmann and he threatens Sally Lockhart. Bellmann is going to marry Lady Mary, the daughter of Lord Wytham, a former minister of Her Majesty's Government. But she doesn't want to be married to Bellmann but Wytham is desperate because he has a lot of debts and Bellmann is willing to offer a lot of dowry. During the course of the book and, Sally and her friends come across many ghastly incidents and revelations and if they have to win their battle against the spiteful Bellmann, they've to devise their own intelligent plot to pull him down. Like its prequel, this book also scores well in the area – language and concept but the story, I feel there is a deterioration when it comes to story. There were digressions and also some loose ends. It didn't suffer any logical flaws. The book is getting these negative comments only because of its prequel but as a stand alone, this book is brilliant. Overall, this is a very good book but because of its digressions and loose ends, this book doesn't score as high as its prequel and it gets an eight.